ROCKVILLE, Md.— The Comfort hotels brand, franchised by Choice Hotels International, Inc. (NYSE: CHH), continues its United States expansion with seven hotels already opening this year from coast to coast. These hotels are the latest to showcase the new Comfort logo, unveiled last May as a capstone to the brand’s multi-year transformation. More than 700 Comfort hotels already feature the elevated look and feel. In addition, more than 170 hotels have installed new signs, while over 450 hotels are in the process of obtaining new signage. Comfort Inn & Suites in Findley Lake, N.Y. Comfort Inn & Suites in Slidell, La. Comfort Inn & Suites in Wildwood, Fla. Comfort Inn & Suites in Michigan City, Ind. Comfort Suites in Burlington, Wash. Comfort Suites in Eufaula, Ala. Choice and its franchisees are investing $2.5 billion in the Comfort brand transformation to deliver a more consistent, up-to-date guest experience. More than 60 Comfort hotels are expected to open this year in major markets, such as Brooklyn, N.Y.; Nashville, Tenn.; Pittsburgh; San Antonio; and San Diego. In addition, there are nearly 300 hotels in the pipeline, 80 percent of which are new construction. For more information on Choice Hotels development opportunities, visit choicehotelsdevelopment.com/comfort/. The Comfort brand, franchised by Choice Hotels, has been trusted by travelers and hotel owners for more than 30 years. 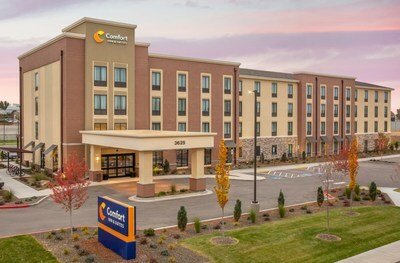 With Comfort Inn, Comfort Inn & Suites and Comfort Suites hotel properties nationwide, the Comfort brand family is ready to take care of guests everywhere they need to be. And with hundreds of newly renovated properties, the Comfort brand is committed to helping guests feel refreshed and ready to take on the day, whether they are traveling for business or leisure. Comfort is the largest 100 percent smoke-free hotel brand in North America with more than 1,800 properties open and operating. At Comfort hotels, complimentary amenities include a hot, hearty and healthy breakfast, free Wi-Fi, business center, and fitness center or swimming pool at most locations. Rested. Set. Go.® Because behind every great day is a great night. For more information, visit www.choicehotels.com/Comfort-Inn,  www.choicehotels.com/Comfort-Suites or https://choicehotelsdevelopment.com/comfort/. This communication includes “forward-looking statements” about future events, including anticipated development and hotel openings. Such statements are subject to numerous risks and uncertainties, including construction delays, availability and cost of financing and the other “Risk Factors” described in our Annual Report on Form 10-K, any of which could cause actual results to be materially different from our expectations. This is not an offering. No offer or sale of a franchise will be made except by a Franchise Disclosure Document first filed and registered with applicable state authorities. A copy of the Franchise Disclosure Document can be obtained through contacting Choice Hotels International at 1 Choice Hotels Circle, Suite 400, Rockville, MD 20850, [email protected].